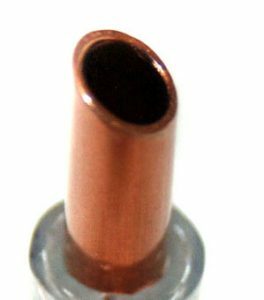 The copper that we use for all our Cat Taps, the Serenity, the bubble-up spouts and the copper Waterleaf is 99.9% pure and is certified for use in drinking water throughout Europe and the United States. It is the same copper used in the plumbing of upscale homes. It is approved by all building codes, is the preferred water delivery material and has been proven to be a natural anti-microbial, meaning that it actively inhibits the growth of bacteria and other unwanted elements in the water. See this link. And this, and this. Man has exploited the inherent antimicrobial properties of copper since early civilization. It has been demonstrated clearly in many scientific studies conducted over several decades that copper has rapid, broad spectrum antimicrobial efficacy against some of the most toxic species of bacteria, fungi and viruses. 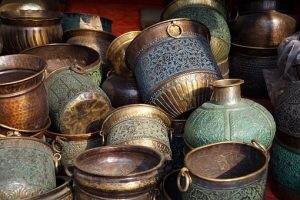 Ancient civilizations exploited the antimicrobial properties of copper long before the concept of microbes became understood in the nineteenth century. 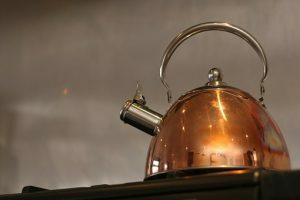 In addition to several copper medicinal preparations, it was also observed centuries ago that water contained in copper vessels or transported in copper conveyance systems was of better quality (i.e., no or little visible slime formation) than water contained or transported in other materials. The antimicrobial properties of copper are still under active investigation. Molecular mechanisms responsible for the antibacterial action of copper have been a subject of intensive research. 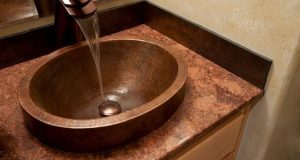 Scientists are also actively demonstrating the intrinsic efficacies of copper alloy “touch surfaces” to destroy a wide range of microorganisms that threaten public health.Our 99.9% pure copper has this same effect in your cats’ fountains, helping prevent the build-up of undesirable materials. It is important that the copper be kept clean and not allowed to build up oxidation which will naturally occur. This is easily achieved simply by dropping the copper component into a solution of 1 tbs salt to 1 cup white vinegar occasionally.To our knowledge, Thirstycat Fountains is the only fountain maker that includes with almost every fountain a copper component which has this effect. Those of our fountains which do not automatically come with a copper piece can have one included. Just ask us for one. There will be no extra charge. Veterinary Doctor Michael Salkin has this to say about it: There is no leaching of copper into the water, it is both safe and beneficial. We knew this but in order to provide empirical, scientific evidence, we submerged a piece of copper in a closed container of water for 3 weeks, then shipped the container to Adirondack Environmental Services in Albany, NY for testing. The result showed there to be less than half the standard allowable copper content in the water and that was probably in the water to begin with. If you want to see the test results, just ask.If, for whatever reason you’d prefer to not have a copper component in your fountain, rest assured. None of the fountains that do not actually come with a Cat Tap need to use the copper spout. All function perfectly well without, and addition, we provide as an alternative, medical grade, antimicrobial tubing which has the same positive effects as the copper.